Exactly what is Far Cry? In an industry that all but insists on building games around a marketable genre, often a series or a game will lose its original identity as external pressure to conform to a single, profitable vision mounts over time. In the case of Far Cry, the last installment introduced some major upsets to some of the series’s most key identifying features, leaving some, like myself, to wonder what is exactly the point of playing a Far Cry game. Is it an open world exploration game? Is it a shooting game? Is a hunting game? Is it a game about taking outposts and gaining territory? It’s difficult to figure out what the developers imagine its primary purpose to be because the focal point so often wanders. With the release of the sequel to Fall Cry 5, now seems as good a time as any to assess. What is being emphasized, and what is being left behind? Far Cry New Dawn is like Far Cry Primal in that it takes a lot of existing Far Cry assets and reconfigures them in a way that I find impressive. Game development is an expensive business, and creatively repackaging Hope County with a fresh coat of post-apocalyptic paint is, from a practical perspective, a stroke of brilliance. I like the feeling of returning to familiar places post-disaster (it’s one of the many reasons I love the Fallout series) and this new spin, which sees the protagonist rebuilding a settlement of survivors following the apocalypse at the end of Far Cry 5, gives the developers a chance to take some liberties with the setting without threatening the series’s core basis in pseudo-reality. The results are gorgeous. The buried ruins, vibrant overgrowth and purple wildflowers that spread throughout Hope County are a welcome facelift on a familiar setting. It’s this same narrative sleight of hand that seems to point Far Cry New Dawn towards a focus on outposts and territorial expansion. The main goal, as the game progresses, is to build up your own base as you gather resources, conquering outposts for the necessary fuel and ransacking old buildings for crafting components. It’s a practical consideration that surprisingly makes much more sense than that of the several games past. The player character’s motivation, to upgrade the survivor settlement of Prosperity and rebuild society, is sympathetic, and provides more explanation for the game’s primary conceit than the one-person-army power fantasies from before. It also provides a jumping off point for some of the most thoughtful writing in the series. While the over-the-top antics of Far Cry are usually supplanted by NPCs who, even when they are on the “right side” of the game’s central conflict, tend to come off as caricatures rather than real people, in New Dawn the writing is more subdued in favor of supporting its themes of post-disaster cooperation. This leads to a few performances and storylines, particularly the Ryes’, that are very humanizing. This is the first Far Cry game with any sense of continuity, and Far Cry New Dawn is much better off for it. The most intriguing parts of the game are spent following up on the events of Fall Cry 5, and the emotional investment I felt during some of the story’s pivotal moments highlights just how detached and trivial the plotlines of the preceding games really are. While I expected New Dawn to take a more neutral or nihilistic position with the protagonist’s role, I was pleasantly surprised. After all these years, it’s nice to see a Far Cry protagonist unambiguously play the hero. The emphasis on outposts continues with some of the game’s newer features. There are now some special off-site side missions, known as Expeditions, that can be completed for bonus crafting materials, which are used to upgrade Prosperity and progress the game. Each enemy base can be conquered three times for additional fuel, which is used at the many stations and tables at the camp to offer new items for crafting. In what may be an attempt to bring back some of the excitement and depth to the hunting system in the absence of animal-skin based upgrades, Elite animals, which provide a brief strategic challenge, can now be found at specific spawn points. However, while a few skins can be used for rare weapons, they don’t contribute to the character building process like hunting did in the past, instead framing the player’s home base as the center of their progression. It fits in the greater scheme of things, but continues to shift the game away from the on-the-fly sensibilities that used to provide a spontaneous survival flair. It would seem that the old “kill four skunks to make a bigger arrow pouch” model is dead for good. As a quick spin off title, it’s clear that New Dawn was never going to be the game that substantially changes Far Cry. But stripping away the game’s secondary experiences helps me realize how much of the games’ stories and additional supporting elements are just a veneer for what is essentially a territorial expansion game. It makes sense why the developers had no problem gutting what made some of the game’s extras so fun—they were never meant to be the primary focus or objective in the first place. At the end of the day, a Far Cry game is about taking down groups of bandits and bad guys in the woods, memorizing AI paths and timing patterns until you take over the whole country one outpost at a time. Far Cry never felt like just a shooter or just another open world game to me, but rather, a combination of many genres that offered balance between the cozier, more relaxing parts of the game and the high stakes, overstimulating pace of the main storyline. I guess maybe that’s why, as I approached this review in the wake of Far Cry 5, I oddly felt the need to pin it to a single identity. I’m disappointed to see the series scale back at the expense of other features but New Dawn does a fine job of reinforcing that creative decision and offers some small hope that the writing may continue to improve. If outposts are your favorite part of the series, then you’ll likely enjoy Far Cry New Dawn. 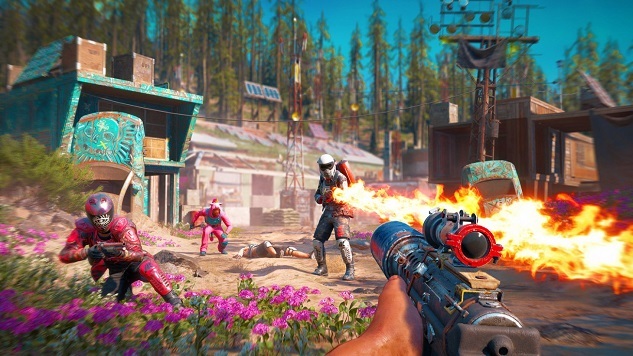 Far Cry New Dawn was developed by Ubisoft Montreal and published by Ubisoft. Our review is based on the PlayStation 4 version. It is also available for Xbox One and PC.